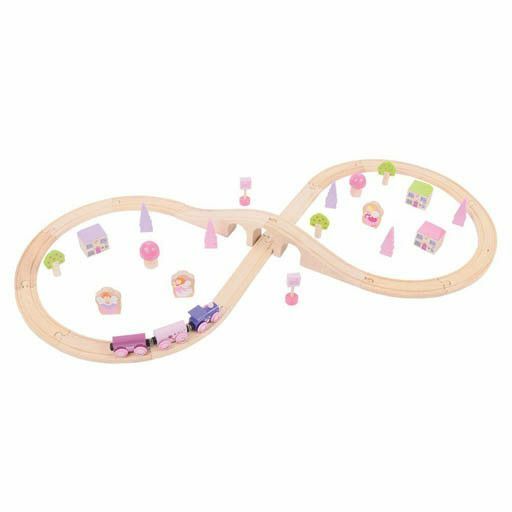 Your train will travel through a magical forest past an adorable fairy village with Bigjigs Fairy Figure of Eight Train Set. Fairy figures and cottages enhance the scene, as the pink and pastel train passes by. The 40-piece wooden railway set includes a locomotive and 2 carriages, freestanding houses, trees, toadstools and fairies. Additional accessories are available from Bigjigs to expand this set. Most other major wooden railway brands are compatible with Bigjigs Rail. Made from high quality, responsibly sourced materials. Conforms to current European safety standards. Age 3+ years. Width: 39 inches Depth: 18.1 inches (assembled). This great, pastel coloured Fairy Figure of Eight wooden train set is perfect for any little princess. Compatible with other leading wooden railways. Set contains 40 pieces. A fun figure of eight track with a viaduct crossing the rail below, it's hard work for the train to climb up, pulling two carriages and a guards van, but fun to whizz down the other side There are quite a few vehicles to play with including an ambulance and police car, where are they all going ? Some of the villagers are walking to the church, some are walking home with their children to their cozy homes Established in the UK in 1985 BigJigs Toys is a family business through and through. Over the last 25 years we have grown into an extended family though a team of dedicated staff. After many years developing the range in the UK and Europe we are now delighted to be launching our range into the United States. BigJigs Toys prides itself on providing great quality products combined with a high standard of service and delivery. All products in the US collection are tested to meet ASTM requirements and CPSIA regulations. 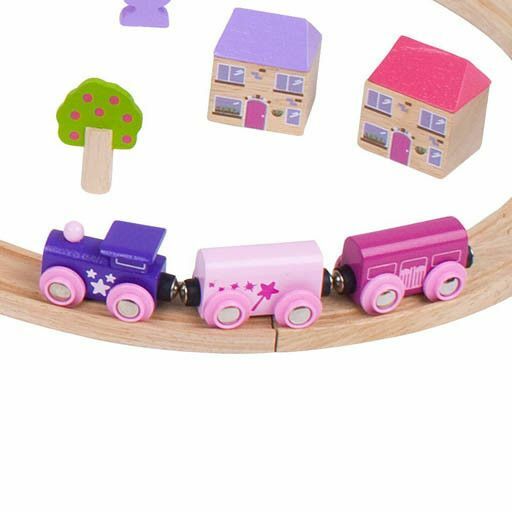 Consisting of wooden train track, wooden train sets, wooden trains, train tables, accessories and much more our trains are compatible with other leading wooden railway systems. BigJigs Rail is the perfect choice for any Wooden Railway collection.